Scouting and camping go together like Girl Scouts and Tag-Alongs and Do-Si-Do cookies. And even though I was a Scout until I graduated from high school, I hated camping. (The cookies, I liked.) In my youth, I did experience Girl Scout camp a few times just to get a measure of nature and wildlife. I’m still in therapy. 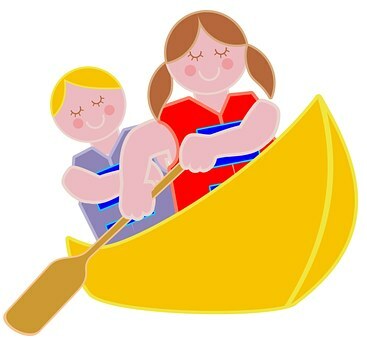 Girl Scout camp was a week-long traumatic experience, I mean, adventure, with scouts of all ages in the great outdoors. No camp worth its weight in bug spray came without hiking, swimming in e-coli-infested lake water, playing with knives, sharpening sticks into pointy lethal spears and standing near a roaring open flame to char marshmallows for carb-laden s’mores. In the dark. Now, tell me, does that sound like a safe place for children? I survived my camping days and I have the badges to show for it, but most of it, I’ve tried to shove into to the recesses of my mind. To celebrate June’s National Campout Day, some clueless friends, who apparently don’t know me very well, invited me to join them at a state park for a wonderful weekend of camping. While they were acting like 12-year-olds, clapping their hands in excitement at the thought of a weekend in the wild, I was having flashbacks. There are 3 reasons I will never camp again. After a few hours of paddling and learning the all-important J-stroke, my canoe partner and I got stuck in a pattern of rowing in circles—for hours. The dinner bell rang, summoning campers to “chow time” and we just kept going—in circles. As the sun began to slip below the horizon, we were rescued by a camp counselor who was sent to the lake to find out what had happened to the two girls who did not show up for dinner. Sadly, she couldn’t talk us to shore. She had to climb into a canoe, paddle out to us and pull us in. It’s funny now, but back then it was humiliating. The girl who got stuck as my canoe partner avoided me for the rest of the week. No outdoor camp is complete without an introduction to wildlife. I don’t mean bears and alligators, but things like spiders and daddy long legs. That was bad enough, but she crossed the line when she brought us face to face with a sssss-nake. Unfortunately, we could not observe it from a distance—like Cleveland. We had to hold it. While it wasn’t exactly mandatory, I could tell mocking and more humiliation would be on the menu for those who refused to pick up the non-poisonous hog’s head snake. I was already vying for the worst camper award, so I…I held it. As I write this, I can still feel its dry, wriggling body in my hands. Cue nightmares. For a solid week, I was intimately acquainted with the camp’s official insect—the mosquito. It wouldn’t surprise me if the entire mosquito population had decided on the day the campers arrived to designate me as the official host for that week. I ran out of Deet-laced bug spray by Tuesday and scratched and clawed my way to the end of the week. To this day, I cannot hear the high whine of a mosquito without starting to slap myself. There were advantages to going to camp. I learned how to start a fire—not by rubbing two sticks together, but by playing with matches and dry kindling. You never know when that might come in handy. I learned all the words to the Girl Scout playlist, which included songs like Make New Friends and Kookaburra. I can still sing them. In fact, I will probably be singing them for the next couple of days now that I’ve resurrected them from my memory. If you ever went to camp, you know you’ll be singing them too. You’re welcome. My friends will go without me this weekend. But in the spirit of unity, I may shove a hot dog on my fork and hold it over the gas flame on my stovetop. It’s as close as I’m going to get to camping. Plus I’m fresh out of Deet.